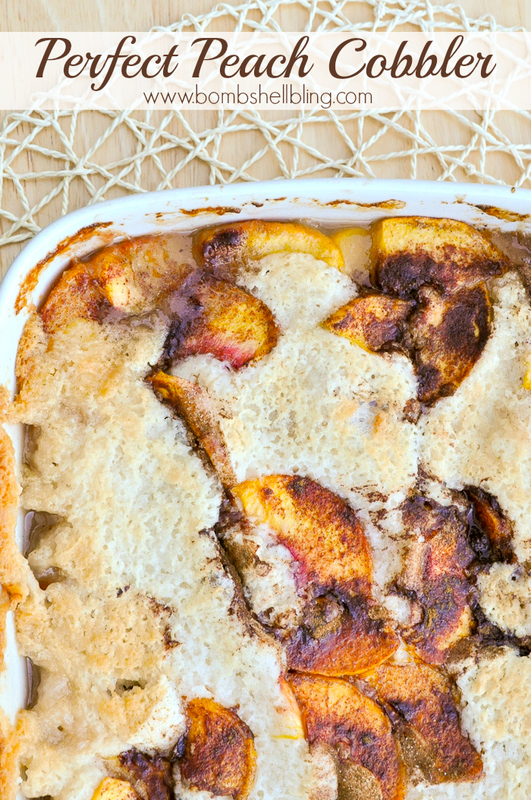 Today is the day, people: PEACH COBBLER day!! My dad’s favorite “splurge” way to eat his precious peaches is my mom’s Fresh Peach Pie, a recipe which I shared a couple of weeks ago. It seriously is amazing. 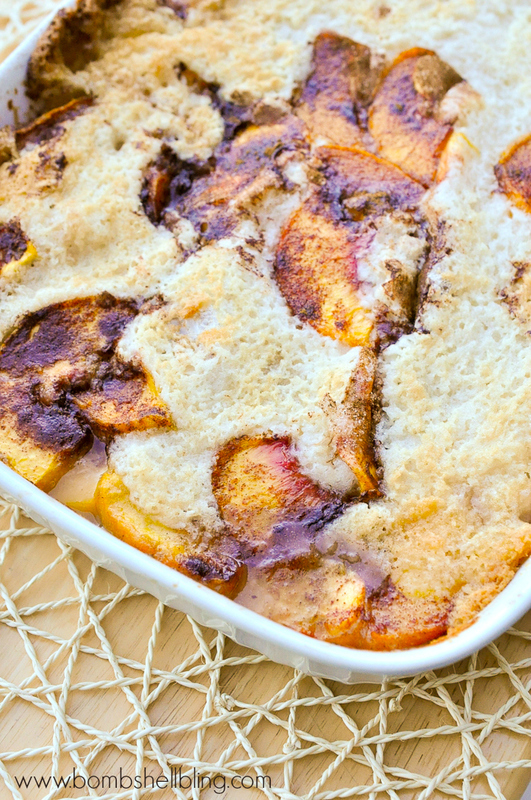 MY favorite way to use our precious peaches is this amazing cobbler. For those of you who don’t know, Palisade is in western Colorado near Grand Junction. One summer my sister drove through Grand Junction and got a huge box of Palisade Peaches. Inside of that box was a recipe for Grand Junction Cobbler. This recipe is a gooey version of that recipe. I always top it with a big scoop of ice cream, and I *ALWAYS* go back for seconds. Seriously…….yum. This is how your cobbler will look prior to baking. 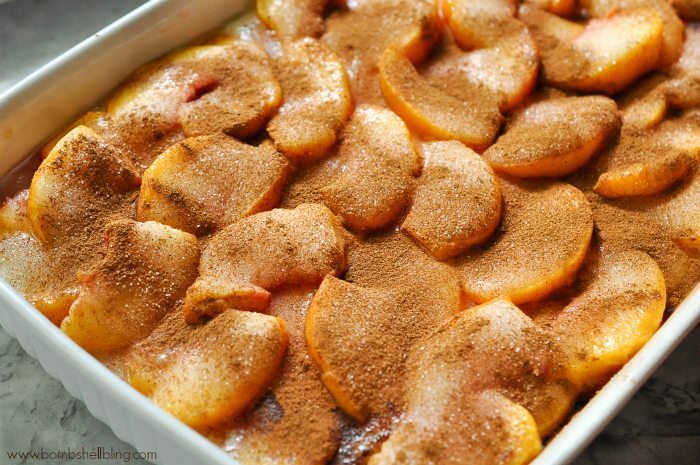 You layer the ingredients in the following order: melted butter, dough batter, peach slices, sugar and cinnamon. I have learned the hard way that you should put a sheet of foil (or a huge cookie sheet) underneath this while it bakes, because it can spill over in a sticky, bubbly, burning onto the oven mess. You have been warned. Now let’s get cooking! This recipe is hard to mess up, comes together quickly, and always impresses a crowd. Enjoy! Melt butter in a mug in the microwave and pout it onto the bottom of a 9x13 pan or dish. Mix flour, ONE AND A HALF cups sugar, baking powder, and salt in a bowl. Pour your oozy, gooey batter into the pan over the butter, but don't mix or stir! Slice the peaches and lay the slices directly on top of the batter. Sprinkle the remaining one cup of sugar over the peaches. Sprinkle cinnamon over the peaches to taste. I am usually quite liberal with it. Bake at 350 degrees until golden brown, about one hour.